Las Vegas, NV -- More American soldiers kill themselves than are killed by the enemy, and many others suffer the effects of post traumatic stress disorder. 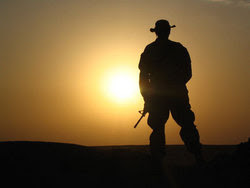 As many as eighteen soldiers a day are committing suicide and most of those soldiers kill themselves after they return home. Their divorce rate has tripled since the beginning of the war and substance abuse among veterans is 4 times the national average. But that’s just the tip of the iceberg according to “Who Will Stand” producer/director Phil Valentine, www.whowillstand4us.com. The two-hour documentary covers the plights of more than a dozen soldiers who have returned either physically or psychologically wounded, including hard-to-measure effects of post traumatic stress disorder. Instead of covering the war in Iraq and Afghanistan and whether America should have gone in there, “Who Will Stand” focuses on the plight of returning disabled American veterans. Phil Valentine and director of photography Michael Bedik began in September, 2007 travelling anywhere they could to find soldiers who were in trouble and were willing to talk. A few months into filming Valentine and Bedik went back to executive producer Gerald Gillock, a Las Vegas Attorney, and told him that the only way we could do this story justice was to only interview soldiers, disabled American veterans, families of soldiers and the doctors who take care of them. Gillock told them to do whatever they had to do to find the truth. The film also addresses why the military and the VA is not doing enough to combat these problems. The film will probably be shown at film festivals initially. You can see the trailer here.